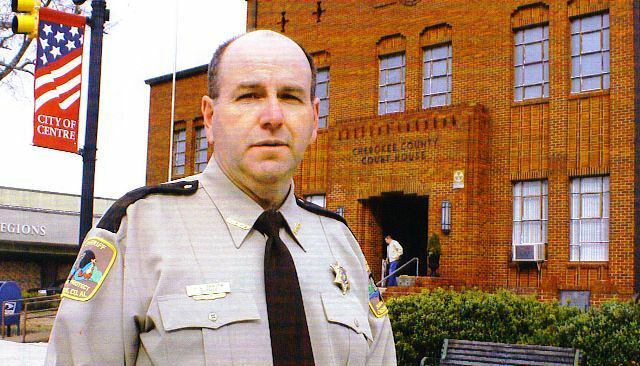 As Sheriff of Cherokee County, it is very important to me to involve our personnel with the local school systems. Sand Rock High School offers an 18-week course in forensics as a core science class taught by John Blackwell. The students are introduced to topics such as types of evidence, fingerprinting, hair and fiber testing, and DNA analysis. The class is interesting and informative for the students who may be considering a career in law enforcement, and for others it gives a better understanding of criminal procedures along with knowledge of local, state and federal laws. Chief Investigator Bo Jolly along with Investigators Tony Monroy, Matt Peek, and Brent Snead have been attending since the beginning of the year and sharing their real life experiences with forensic science class. These investigators have devoted several hours of training to help these high school students with demonstrations and explanations of how forensics is applied by local law enforcement officers. This reinforces textbook instruction and provides a better understanding of forensic principles. I agree with Mr. Blackwell and would like to express my thanks to these investigators for working with our students to better prepare them for their future.